Manchester, NH (October 30, 2017) – Today, Iraq and Afghanistan Veterans of America (IAVA) Executive Director Allison Jaslow joined Senator Maggie Hassan and women veterans in Manchester, NH to highlight the need for better access to quality care and services for women at Veteran Affairs facilities across the country, and to bring attention to IAVA’s She Who Borne the Battle campaign. 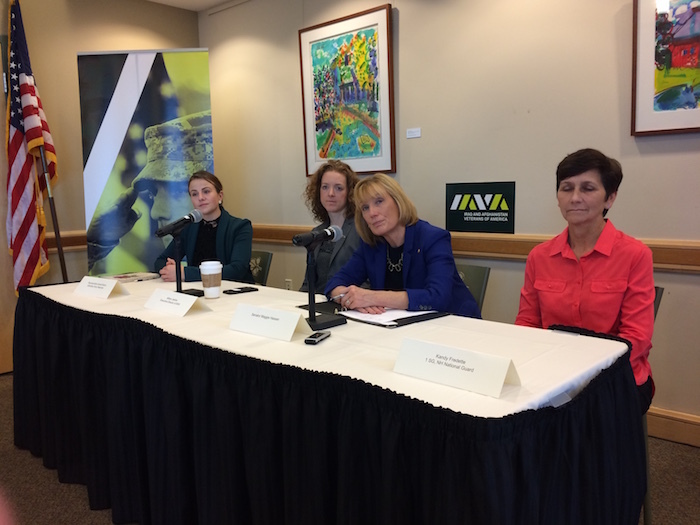 Senator Hassan and IAVA’s Jaslow discussed the bipartisan Deborah Sampson Act, co-sponsored by Senator Hassan, ​which would help address gender disparities at the VA and ensure that women veterans are receiving appropriate care. IAVA pushed the legislation as a key part of its She Who Borne the Battle campaign. Senator Hassan and IAVA’s Jaslow penned an op-ed in the Union Leader today drawing attention to the need for reform at VA facilities for women veterans, including enhanced privacy, added primary care providers on staff, improved mental health treatment and peer-to-peer counseling, and expanded infant care, which would be addressed under the Deborah Sampson Act.